Maybe you’re stockpiling sweaters, button-downs or old costumes that aren’t worthy of the donation pile (read: stains, rips), or perhaps you’re trying to disguise a re-gift with exciting packaging. Either way, TODAY has you covered! TODAY Style contributor Anna De Souza stopped by TODAY Thursday to share how a few clever hacks can make your gift the most impressive package under the tree. Wait to go, Santa. 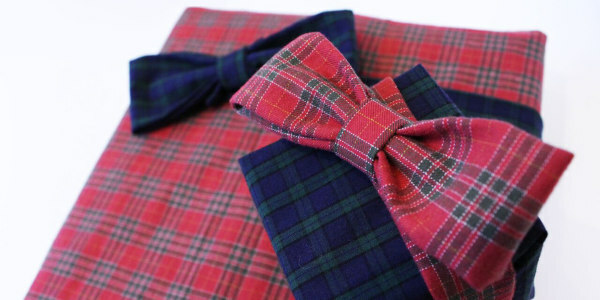 Plaid and tartan are the "it" pattern of the season and thankfully this classic print is so common in our closets. Put that dusty old flannel you don't need anymore to good use with a wrapping hack that’s equal parts masculine and sweet. Plaid and tartan are the 'it' pattern of the season. Lay a button-down shirt flat and cut across horizontally, starting right under the underarms. Discard the top section. Next, wrap gift by centering on the fabric with buttons facing in. This will give you a crisp, flat look. Don't forget to wrap with triangle corners and tape with fabric tape! With your contrast plaid shirt cut two 2-inch wide strips starting from the bottom towards the shirt’s neckline. Fold and hot glue raw edges toward each other to create a makeshift ribbon that’ll wrap around your gift. With your last fabric strip, fold a 1” long piece into a clean ribbon by folding raw edges towards each other. Hot glue onto the middle of the bowtie to secure together. To recreate this whimsical and rustic package all you need are a few pom poms from a kid’s sweater – or an old Halloween costume – some baker’s twine and a small dry tree branch. Wrap baker’s twine around wrapped gift six to seven times. Secure with tape on back. Weave branch through baker’s twine and hot glue into place. Hot glue colorful pom poms onto branch ends to mimic a minimalist holly shrub. 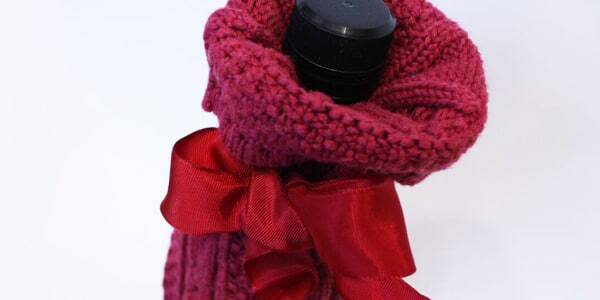 There’s nothing cozier than a bottle of Cabernet enrobed in soft cable knit! The more ornate the knit’s sleeve design, the more festive your final product! Any color sweater can work: white, gray, purple, green — use whatever you have handy! Insert your bottle into the sleeve with the top facing sleeve cuff. Give it some room to move, fold down sleeve for a charming touch. Next, cut sweater one-half inch below the bottle’s bottom. Using the same sleeve, cut another 3” cuff and slice it vertically so it lays flat. This will serve as the flat bottom for your sleeve. Measure and cut around the circumference of your bottle about a half-inch larger. Next, turn the full sleeve inside out and sew or hot glue the bottom onto the sleeve. Turn it right side out. 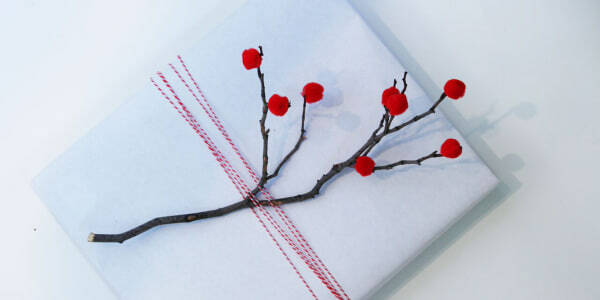 A monochromatic ribbon tied into a bow finishes this dressed-and-ready-to-be-merry package! Give new life to that old studded sweatshirt. Those metal grommets offer an upscale decorative element that’ll keep your giftee from shredding your gift wrap to pieces — at least for a few minutes! Give new life to that old studded sweatshirt. Remove studs from garment, either manually or with scissors. 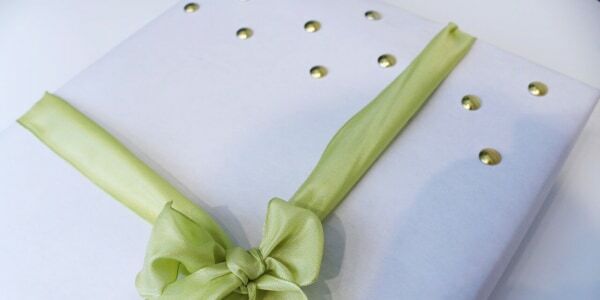 Hot glue studs directly onto wrapping paper. The first row will be staggered from the second. Use a ruler to line up the studs, your eyes are incredibly deceiving and a uniformly straight line is key. Finish with a bright wired ribbon.